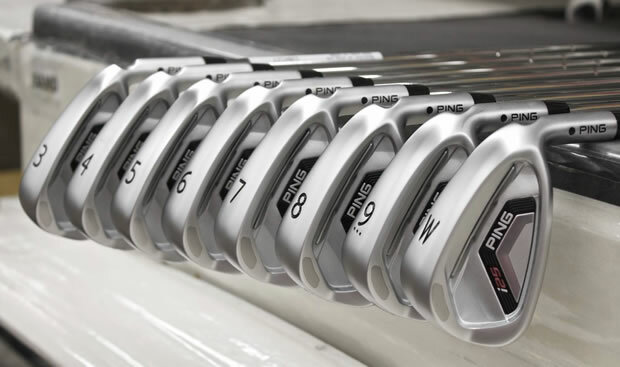 The Ping i20 irons were a big hit with a wide range of players. Mid handicappers to Tour players such as Lee Westwood enjoyed the feel and forgiveness the i20s they provided. Therefore, Ping had its work cut out to create a successor that would improve the i20's design and appeal. Their answer is the Ping i25 iron. A cleaner, simpler look highlights a design that is made to be softer in the shorter irons and faster and more forgiving in the long irons. Various design and construction techniques are used to make the i25s, highlighted by the added material in the back of the clubhead. Like the i20s, the i25s feature a Custom Tuning Port (CTP) and a tungsten weight. The CTP is designed to alter the feel of the iron and make it feel softer than a typical game-improvement iron, whilst also aiding in controlling a players trajectory. The high-density tungsten weight is position in the back of the toe. By adding a heavier material in this location, Ping were able to position the sweet spot and centre of gravity closer to the toe whilst improving forgiveness. Each Ping i25 iron features Dual Stabilizing Bars in the cavity behind the face. These bars are narrow and thin in the long irons making them faster and more forgiving and wider/thicker in the short irons offering more flight control. The bars are more discreet and centred than before and help strengthen the face without adding unwanted weight. Much like the stabilizing bars are shorter wider in the short irons, the profile of the short irons is also shorter and wider. Throughout the i25 set, the length of face and the width of the sole alters based on the club. Longer irons have a longer face, more offset and thinner sole to launch the ball higher with more forgiveness, whilst the shorter irons are shorter in length, with less offset and wider soles. The foggy chrome finish of the i20 is maintained in the i25, which is noticably darker than the Ping G25 irons. A total of 11 irons are available in the i25 set, each with an RRP of £90 in steel shafts and £110 in a graphite shaft. The standard set is 4-PW, which will start with an RRP of £630. The stock Ping CFS steel shaft is available in four different flexes, whilst the standard TFC 189i graphite shaft is available in three.